Travel photography isn’t all about having the biggest lens and best camera. Better equipment may help improve your photography, but the most important thing is the development of your creative, photographic eye. Seeing the world with your own unique photographic eye will make your travel photographs stand out amongst the millions of images taken at each destination. The good news is that you can train your photographic eye and better your potential as a photographer by doing some exercises and purposely choosing the best aspects that make a great picture. By following all ten or even just a few of the methods below you’ll see your photographic eye develop and your photos improve dramatically. At breakfast, lunch or diner, arrange your plate, coffee, cutlery and other things to how you think it would work perfect for photography. Think about light, composition, patterns and colors. Repeat this for a week to encourage your mind to see it differently every day. The ability to take an outstanding photo begins BEFORE you even pick up your camera. Take a walk around without your camera and look for photographic opportunities. You need to see things first. Your photographic eye must see things first. Linear effects are great to add perspective and direct the viewer where to look. Visit an open scene (soccer field, beach, park,…) and look for lines that enhance perspective. Are there natural lines like a row of trees, the tide line in the sand or man-made lines like gutters, streets and lamps? Once you’ve found a line, imagine how you would photograph it. Would you frame the image to have the line coming out of the corner or straight down the middle? The quality of the available light can make all the difference. Practice researching the best times for your area to shoot warm afternoon light and then look for locations that soak it all up. You’ll be amazed at how different a photo can look once you start to think about its composition. Take your camera to a familiar place that you visit regularly. It can be your office, a supermarket, a park or anything else. Capture the place in one photo without thinking too hard. Now try to create a better composition. Where you standing and pointing straight ahead? Could you try a different angle? Looking up, along the ground or with something in the foreground that sums up the sense of place? Grab a friend or family member and ask them to be your model for half an hour. Use them as a subject to frame within the environment and take ten photos that each has a different composition. Taking a photo of a person doesn’t mean they have to be front and centre. You can hide them behind a tree so just their legs are poking out. Have them walking into the sunlight so the warm glow wraps around their body. The possibilities are endless so be sure to review your images and again look for any improvements or develop new ideas for your next attempt. This little exercise encourages you to see more in boring motifs or landscapes which are ignored by most photographers, especially amateurs. Take a bottle of water and photograph it on an empty table against a blank wall. Try to see more than a boring bottle in front of a blank wall. Can you find some light sparkling in the bottle? You could focus only on the bottle top and shoot downwards, or frame it using the table edge as a blurred foreground haze. If your first attempts are as boring as the motif, try again and again until you have a photo you really like. We ll take dodgy photos at one time or another. Don’t worry about that. Its all about learning from your mistakes. Look through your last bunch of holiday photos. Be your own critic and write down ways to improve each shot. Even the photo of you standing in front of that famous sight or at dinner. Every shot can always be improved or taken in another unique way. If you have Photoshop or another post-processing software you can even try to improve your worst images. Hmmm. Something is missing in this picture. How about humans? Spend a day with your camera aimlessly wandering around your town photographing whatever takes your fancy. Try to capture scenes as creatively as possible whether it be a shop window, a parked car or a pedestrian crossing. Imagining a scene and then seeking to recreate it in reality is another great way to boost your photographic eye. Plan your next photo location shoot or your next weekend away based on the idea of a photo. Try to transform your idea into reality. 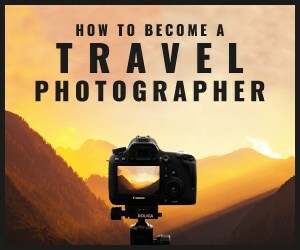 By the way… If you´re interested in creating a travel blog to showcase your travel photography The Superstar Blogging Course is the best thing you can invest in. It is a multifaceted school, created by my friend Matthew Kepnes, better known as “Nomadic Matt” teaching you all aspects of running an online travel website. Featuring industry experts, renowned writers, photographers, marketers, and YouTubers, this program brings you the knowledge of some of the most successful online personalities in the world! Experience the joy of doing what you love, helping others, sharing your passions, and earning a living traveling the world. Take your passion and career to the next level. A photographic eye helps you a lot in this course. You will get it for free if you do the exercises presented in this post regularly.